Hosted Voice (also known as Hosted Private Branch Exchange or HPBX) is a comprehensive, scalable end-to-end Voice over IP solution for your business whether you have five or five hundred phones. 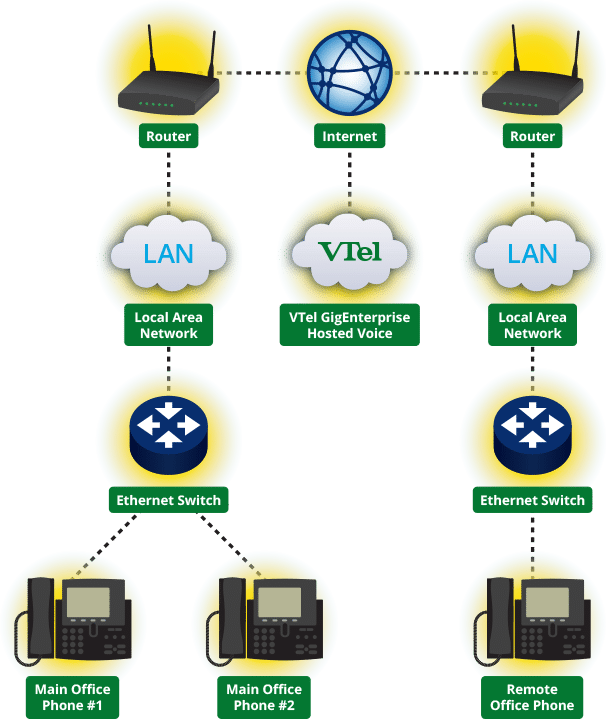 With no expensive hardware to purchase and the ability to add multiple seats per line, it also provides an incredible value as your phone system grows with you. Built on the backbone of the VTel fiber network, our Hosted Voice delivers a powerful and reliable service. VTel hosts and maintains your phone system, so you are all taken care of while you are taking care of business. Hosted Voice is delivered entirely over IP. VTel handles switching for as many lines and seats as your business needs. Request a quote here for a Hosted Voice solution custom-fitted to your business. Functionality– Get all the great calling features like call forwarding, find me/follow me call routing, call screening, voicemail to email transcription, and more, all easily accessed and managed on your desktop or mobile with a powerful, yet simple software interface. Simplicity – Telephony functions for numerous sites are consolidated into one place.